When you ask your child to put something away, are you met with a blank stare? Does your child begin to follow multi-step instructions and then stop because she can’t remember the next step? Following directions is an essential life skill, yet it can be tough to learn — especially for children with developmental challenges. Why Do Some Children Struggle with Following Directions? Following directions depends on several other skills, including hearing, language processing, understanding (vocabulary and concepts), attending, sequencing, and working memory. Some children have difficulty in one or more of these areas, which in turn effects their ability to follow directions. Why is Following Directions Important? Following directions is at the heart of learning and can directly impact a child’s ability to perform daily routines, develop socially, and to be academically successful within the classroom. Struggling with this task can negatively affect a child’s functioning at home and school, ability to make friends, self-esteem, and behavior. What are Milestones for Following Directions? 3 – 4 years: Follows 2-3 step related and unrelated commands (go get the ball, put it in the toy box, and come here). What are Red Flags for Difficulty Following Directions? 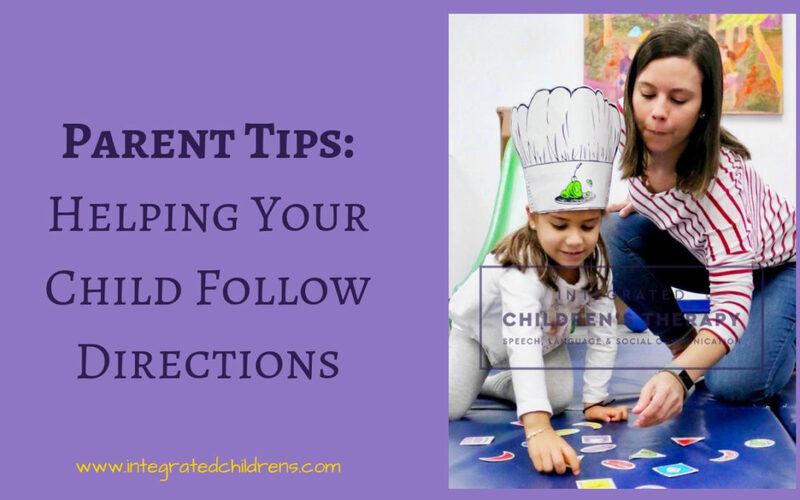 How Can You Help Your Child Learn to Follow Directions? Make eye contact – this helps ensure that you have your child’s attention. Use simple, direct, and specific language – rather than could you please go and pick up your toy, try please get your block. Or, rather than would you please clean up your room, try please put your dirty clothes in your hamper. Ask your child to repeat the instructions – this lets you know she heard you, and reinforces her understanding of what you said. Break down multi-step directions – if you want your child to put her shoes away and start her homework, say please put your shoes next to the door. When she has done that, then say please bring your homework to the kitchen table. Use first and then – this helps your child do things in the correct order: first put on your shoes and then go outside. Use visuals – for non-readers, try using images for common instructional tasks. For example, if your child has trouble sequencing the steps involved in brushing her teeth, create a drawing of the steps and tape it to the bathroom mirror. If your child is a reader, write instructions down so she can refer to the paper if she needs to. Encourage asking for clarification – tell your child to ask for help! Seeking clarification, in itself, is a valuable language skill, so encourage her to and praise her for doing it. If your child already works with a speech-language therapist, be sure to align your at-home efforts with therapy activities and goals. If your child does not work with a speech-language therapist and your at-home efforts aren’t effective (or she exhibits difficulty in other areas of language), a skilled speech-language therapist can help you evaluate her challenges and needs.